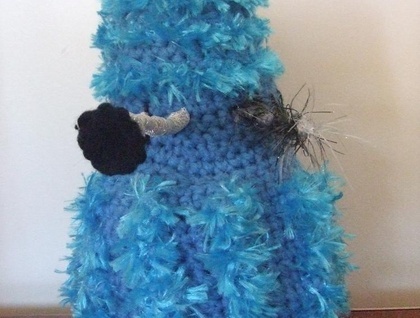 A one of a kind (slightly camp) fluffy blue Dalek. 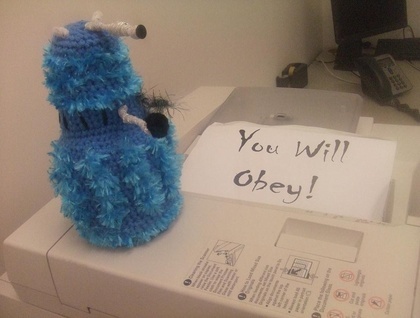 Dalek George was created for a crochet/knit team challenge. He's had his photo shoot (check out his adventure on the blog http://jac-bercreations.blogspot.com/)and is now ready for a home. 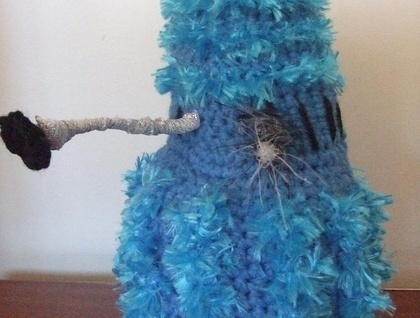 Crocheted in an amigurumi style he stands about 20cm tall and has yarn covered pipe cleaners for his eye stalk, his sink plunger arm and his whisk zapper arm. He is filled with a mixture of yarn and material odds and ends.